1. Hawaii Bowl: The Hawaii Bowl kicks-off at 3 p.m. local time at the Aloha Stadium, and the event is always a draw for sports fans who prefer to watch their football minus the freezing temperatures. This year, the University of Cincinnati will face-off against San Diego State University. 2. Waikiki Beach Walk: The Beach Walk is home to the Holiday Mele, a week-worth of holiday entertainment that runs from Dec. 19 through Dec. 25. From 6-7 p.m. every night, you can find different entertainers ready to help you celebrate the holidays, including Pookelo, Ohana Kalikimaka, and Kualoa. 3. Kawaiahao Church: The live nativity at Kawaiahao Church in downtown Honolulu will be on display until Dec. 23. 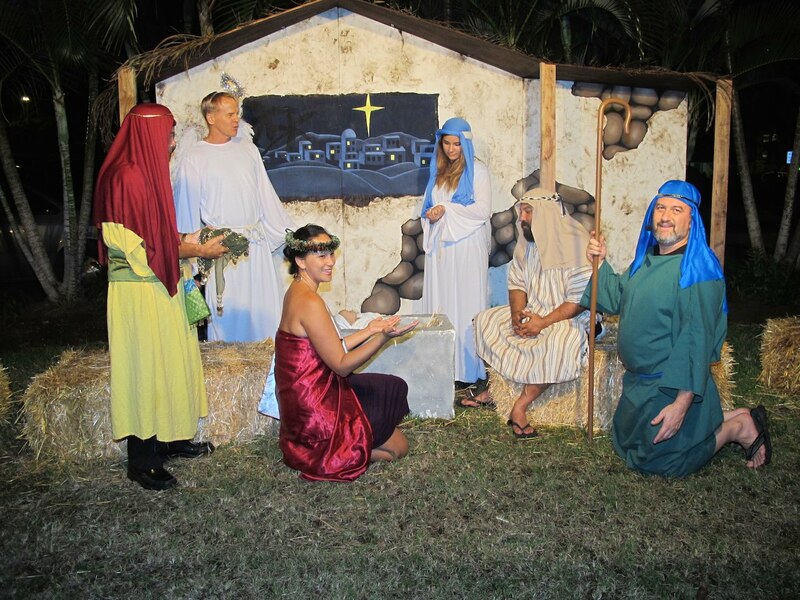 At 7 p.m. every night, you’ll can enjoy live music, a queen’s blessing, and the live nativity, and keiki fun. The live nativity scene at Kawaiahao Church in downtown Honolulu will be on display through Dec. 23. 4. 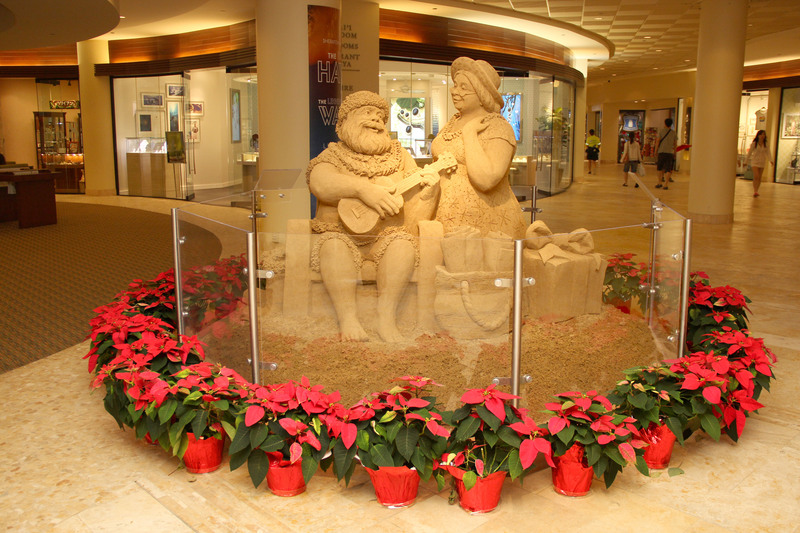 Sheraton Waikiki: View this year’s giant Christmas sand sculptures at the lobby and entrance of the Sheraton Waikiki. “Santa’s Selfie” and “Santa’s Serenade” took weeks to assemble, and you can see why when you visit this landmark Waikiki hotel. When you book your room at the Sheraton Waikiki through Hawaii Aloha Travel, you’ll have front-row access to the sand sculptures and be within walking distance to the Waikiki Beach Walk and the Royal Hawaiian Center. 5. Ala Moana: Monday through Saturday, you can enjoy free holiday entertainment with Holiday Hula Shows at 1 p.m. Although the mall is closed Dec. 25, you can still do some last-minute shopping, since the venue is open Dec. 24 from 8 a.m. to 6 p.m.
6. Honolulu City Lights: When the sun sets in downtown Honolulu, that’s when things really light up! The annual display is free and open to the public through Dec. 31. You can take a Waikiki Trolley to the event or even reserve space on a firetruck that hosts Honolulu City Lights tours. Don’t forget to purchase tickets for the keiki rides, located just beside the enormous light displays. 7. Royal Hawaiian Center: Santa Marty is visiting the Center every Wednesday till Christmas, including Dec. 23. From 6-8pm, enjoy holiday jingles by Kawika Trask and Friends in the Royal Grove and get pictures with Santa in front of our Hawaiian Chrsitmas tree, decorated with palaka bows, ukuleles and more. The Center is open on Christmas Eve AND Christmas Day. 8. Santa Arrives: Each year, Santa arrives via outrigger canoe on Christmas Eve, Dec. 24. Grab the kids and head to the beach in front of the Halekulani Hotel for this fun-filled event. Santa arrives at 4:30 p.m.
9. Polynesian Cultural Center: Enjoy holiday canoe rides during the 12 Days of Christmas at the Polynesian Cultural Center. The event will begin at 6:30 p.m. – 9:00 p.m. each evening. Rides will be $5.00 per guest. Those who present a Pepsi product upon entry will receive a free canoe ride on the Polynesian Cultural Center’s lagoon. Keiki can enjoy festive train rides throughout the Center, which are free for ages 4 and under and only $3 for ages 5 and older. 10. USS Missouri Battleship: On Christmas Eve, Dec. 24, you’ll have the opportunity to take photos with Santa at the USS Missouri Battleship in Pearl Harbor. Guests are invited to take photos with Santa using their own camera. There will also be a chocolate station where guests can purchase a box of chocolates for service members overseas and personalize the gift with a postcard. Photos with Santa and the chocolate station will be available from 8:00 a.m. to 12:00 p.m. at the Mighty Mo’s Center Pier. Round-trip shuttle service is complimentary with the cost of admission. For those without base access and only wanting to visit Santa, there is a round-trip shuttle cost of $3.00 per person available for purchase at the Pearl Harbor Visitor Center. If you’re spending Christmas in Hawaii, you have no shortage of ways to get into the Christmas spirit! So, get out and enjoy the holidays “island-style”!